The Supreme Council of Antiquities (SCA) has already informed the proper legal and security authorities in Egypt and are taking the necessary procedures. One had a suspicion that something like this would be forthcoming! The 'Berenike Panchrysos' is said to be their 'previous discovery', so does this make the assumption of the lost army invalid too? One might not like it, but it is clearly stated in the contract signed by any director undertaking archaeological research in Egypt that any significant discovery must be reported to the SCA. If one disagrees, he is not obliged to sign the contract. By experience, it is true that you are not kept informed by the SCA of the dateof the public release (if any). Unfortunately, such scientifically unsound announcements as the one done by the Castiglionis, completely justify this SCA rule, intended to prevent these false or prematurate public announcements. If the Castioglioni consider that they don't need to follow the Egyptian legislation to conduct archaeological research in Egypt (whatever it says and how criticable it might be), don't be surprised if they have problems. What would be the reaction if someone starts excavations in Britain, France or anywhere else without the proper authorization ? 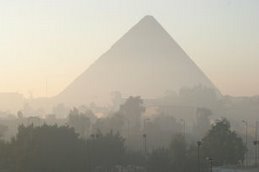 Now, the question of the competence or the real intentions of the people in charge in Egypt is another problem. Don't mix up things.